A future where homes are free of toxic materials, construction materials are fully recyclable and reusable, and we create more energy than we consume. That’s the vision of writer and green living expert Jennifer Roberts, author of the 2006 book Good Green Kitchens. Here are a few of her tips for integrating ecological design into your kitchen renovation plans. When home owners are thinking about replacing the floor in their kitchen, they rarely consider the environmental costs of their choices, writes Roberts. Roberts suggests reclaimed wood, such as material reused from abandoned buildings, or wood from FSC certified forests and plantations. When thinking about upgrading your storage by installing new cabinets, here are some things to consider. Avoid low-quality cabinets that will quickly end up in a landfill. Try fixing up your old ones instead of replacing them entirely. Tricks include replacing dated hardware, like knobs and drawer handles. 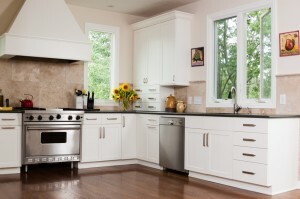 If you plan on replacing the cabinets, consider getting them deconstructed into usable materials instead of demolition. Choose products made of green materials like bamboo or even metal, which often contains recycled materials, and which can always be recycled later on. Like all other aspects of the home, choosing something durable that you love will mean it lasts for decades. And like other parts of the kitchen, some counter material can be salvaged from other buildings, instead of being sent to the landfill, if you know where to look. Don’t succumb to the advertising pressure to plug in extra “drawer-style” appliances, like mini fridges. “Install the instead of, not in addition to, full-sized appliances,” writes Roberts. Choose an Energy Star approved fridge and when you replace your old appliances, get them recycled. Get your leaky faucets fixed: thirty drips per minute will waste 130 gallons of water per month.